Your finance team is usually a well-oiled machine, hitting reporting deadlines and closing books with precision. But even companies with top-notch leadership occasionally wobble and suffer from subpar performance. As long as everyone recovers their balance and gets back in the groove, it’s all good. However, if management doesn’t right the wrong, employee productivity keeps falling. As the leader of your department or company, it’s up to you to motivate workers and make sure employee productivity, morale and stress remain at healthy levels. To do that, you need to recognize the situations in which effectiveness on the job tends to slip, take steps to avoid them and take action if you see them. Here are five situations to watch for, along with advice for how to maintain and boost employee productivity. When there’s a vacancy in management, a finance team can temporarily operate and still get its work done. But at some point, someone needs to step in full time to steer the ship, make course corrections and set new goals. Of the CFOs responding to a recent Robert Half Finance & Accounting survey, 78 per cent said leadership vacancies either greatly impede or have a somewhat negative impact on workers’ performance. See an infographic, below, which shows how unfilled manager positions sap productivity. Employee productivity tip: Don't take so long to hire. Most companies aren't quick enough during the recruitment process, especially for positions in management. It takes an average of six weeks for employers to fill a senior position, according to another Robert Half Finance & Accounting survey. The sooner you have someone in place to oversee a team and really care about its performance, the less worker productivity should slump. This is especially damaging to smaller accounting firms, where workers typically wear many hats. If a payroll specialist leaves a large company, others in the department can cover various projects until the position is filled again. But in a small organization, where one person may be in charge of payroll, human resources and accounts payable/accounts receivable, a vacancy can seriously hamper productivity. What’s more, when top performers depart, other employees sometimes follow them out the door, which creates a staffing nightmare. Employee productivity tip: Prevention is key. Minimize the odds of losing talent with an effective employee retention program. This includes financial incentives such as bonuses and raises, but also quality-of-life perks — especially flextime and remote working arrangements — that help workers balance their professional and personal lives. Don’t forget to have career-path conversations with top performers, who are less likely to leave if they see a future within the firm. But since most people don’t stay with one employer for life, management needs to prepare for vacancies. Whenever possible, cross-train staff so the departure of one person doesn’t hobble productivity. Also, develop a good relationship with a recruiter or staffing agency so you can quickly and easily fill vacancies. Need to hire? 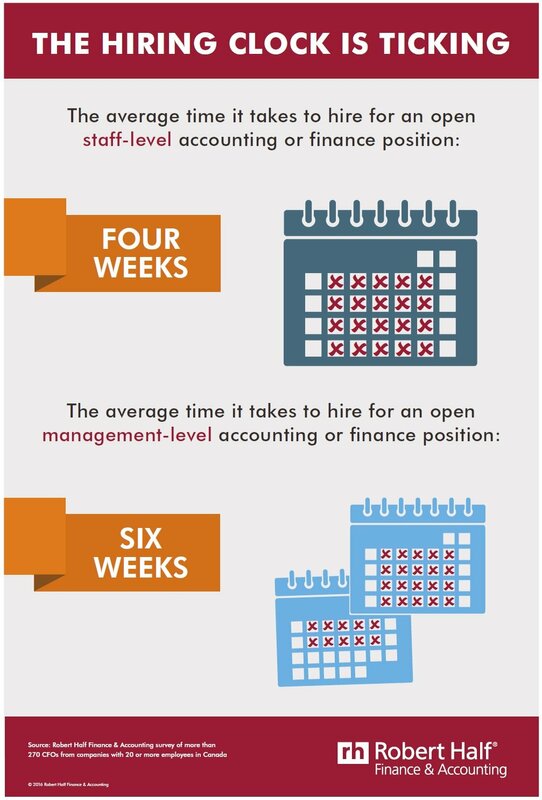 Let us help you find the right finance or accounting professional for your team. Being busy is great for an accounting firm, but not so much for staff motivation. In fact, 18 per cent of CFOs in our survey said the greatest cause of lost productivity is increased workload. Employees can multitask only so much before efficiency drops and the error rate increases. Plus, job satisfaction dips when working evenings and weekends becomes the norm rather than the exception. Employee productivity tip: Increase staffing as necessary so your workers don’t burn out. For peak periods like tax season and year-end closing, bring in part-timers or contractors to handle extra reports and other work. Also, encourage employees to use all their vacation days. Everyone needs to get away from the workplace to unplug, unwind and recharge. Group get-togethers are necessary for planning, brainstorming and debriefing. But too much of a good thing is counterproductive. Employee productivity tip: Take a close look at your team’s calendar to see where you can cut back. Change weekly meetings to every other week where possible. Feel free to cancel a regular phone conference if the same information can be covered in an email. People are most productive and innovative when they have large blocks of time to focus on a task. Recognizing this fact, some companies even institute no-meeting days. This happens to countless workplaces: You upgrade a system or platform with the goal of saving time and effort, but something goes wrong — leading to downtime — or worse, data loss. Management then scrambles to come up with a fix or workaround so productivity doesn’t come to a grinding halt. Employee productivity tip: Invest time upfront to reduce the risk of a failed upgrade. Start by meeting with all shareholders — staff, vendor, IT — to plan the rollout. Don’t skimp on the QA phase; have actual users test each functionality in addition to the developers. And if possible, opt for a series of smaller upgrades than one massive one. Your business can ill afford a slump in employee productivity. Recognize the situations when workplace efficiency is likely to drop, and then either head them off or take immediate action to get employees right back on track. What else helps with productivity? Read 5 Ways Financial Managers Can Promote Happiness at Work.